If you’re installing hardwood flooring or laminate flooring you’re probably going to need some trims and transitions to add the finishing touches. If you’re installing a floating floor you will need these trims to allow for expansion. Most trim pieces will include a track to attach to. Use this guide or give us a call and we will help you determine what trim pieces you will need to finish your project. Some times referred to as a shoe base is a convex molding that has a cross section forming quarter circles. Quarter rounds add aesthetic appeal by covering the uneven edge between flooring and baseboards. Quarter rounds come to match hardwood and laminate flooring and can be purchased from the same manufacture as your flooring. Typically used to join two wood floors in adjoining rooms, or when making a transition from a wood floor to another type of flooring that is approximately the same height. This transition piece is used to bridge the gap between two different floors that have a height difference by creating a small ramp that connects the floors. A reducer can be used for laminate flooring or hardwood connecting to tile, laminate or other flooring with a height difference. End Moldings allows for the necessary expansion and contraction gap for hardwood and laminate floors, creating a smooth transition between laminate and carpet, Hardwood and carpet, as a transition to an outside door as well as many other uses. End moldings are sometimes called a square nose, baby threshold or an end cap. This trim piece is a necessity when your project includes a staircase, it cover the nose of the stair over the top or flush mount. Use this trim piece to cover the unfinished edge of wood or laminate stairs. 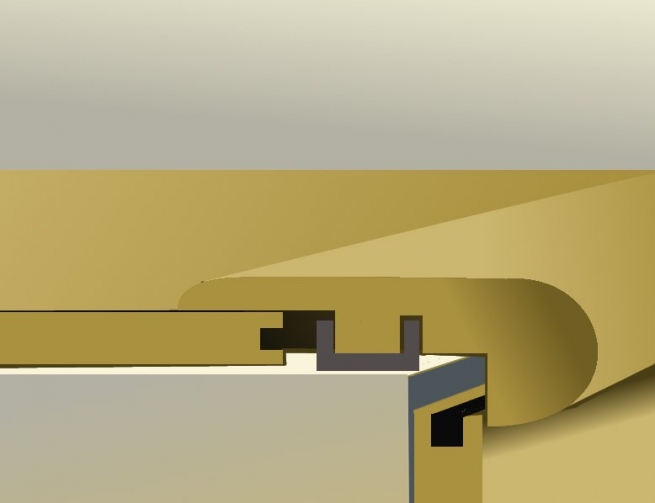 Stair nosing is typically found with an option of flush or overlap.